This is another High Wycombe gig that has grown in legendary status over the years. 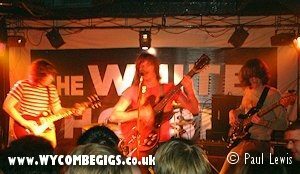 Kings of Leon, a much hyped-up ‘pop rock’ band from the USA, were booked to play The White Horse as their first ever date in the UK and as a low-key warm-up for a planned appearance at the NME Awards Show as support for The Coral at London’s Astoria on 11th February 2003. 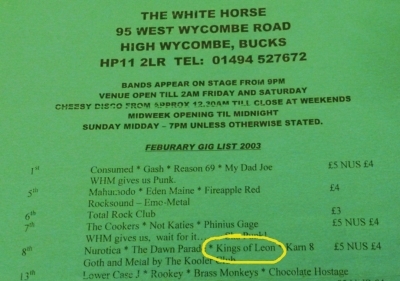 That gig was subsequently postponed due to ill health in The Coral camp, and Kings of Leon’s London debut was switched to Highbury’s Garage venue on the same date. Formed in 1999 when the three Followill brothers, plus their cousin, put together a four piece outfit, The Kings of Leon, apparently named as a tribute to their father and grandfather (both named Leon), took their influences from bands such as Thin Lizzy, Rolling Stones, The Clash and The Pixies. They signed a record deal with RCA during 2002 but their debut output, an EP entitled Holy Roller Novocaine, was a few days away from official release as they took stage at The White Horse. The line-up that night were brothers Caleb Followill (21 years old, lead vocals and guitar), Nathan Followill (23, drums) and Jared Followill (16, bass), plus cousin Matthew Followill (18, lead guitar). 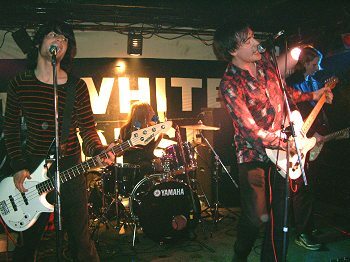 It was the reputation of the venue that seems to have taken this gig into the mythological stratosphere. The White Horse is perhaps better known in local circles as an old school ‘strip pub’. 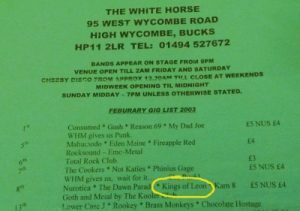 But in the late 1990’s the sudden closure of The Nag’s Head as a music venue, led to the West Wycombe Road venue taking on its booking sheet. It proved a huge success, with Alternator gigs also being asked to showcase their gigs at the 200 capacity venue from late 2001 onwards. Other promoters also managed to attract the likes of the UK Subs, The Dickies and The Damned in order to keep the ‘punk’ crowd happy. Gigs would take place after the ‘Exotic Dancers’ had finished their day-time acts at the same venue. However, on evenings when there was an extended line-up or when one or more of the bands turned up early, they could be confronted with dressing rooms still in use or with the stage still featuring a vertical pole! It appears The Kings of Leon may have fallen into the latter category. This ‘warm-up’ gig for the Kings of Leon saw the Nashville boys knife and forked into a line-up that was billed as ‘Goth and Metal’ in the pre-gig flyers but also included up and coming local band Dawn Parade, plus true Metal acts Nurotica and Karn 8. The mixture of attractions, plus word of mouth suggesting that KOL could be the ones to watch, meant the venue was rammed. Kings of Leon took the stage at around 10.15pm, they played a relatively short set based around tracks from the soon to be released EP and with the stand-out number, Molly’s Chambers. The band members sported fairly long-hair at the time, giving more of a ‘Spinal-Tap’ visual impression than the up and coming mega rock stars they were to become. As musicians, they were still learning their trade, particular 16 year old Jared on bass but there was no denying the songs were catchy and there was an obvious gel between the band members – obvious, really, if you were aware they were all related. There was no encore but they left an impression. The YouTube clip below was recorded at Townhouse Studios London, I believe, a week or so after the High Wycombe gig. Check out the hair!